Welcome back and thanks again for reading the EAA Vintage Aircraft Association’s Vintage AirMail e-Newsletter. Here we go again! I feel like I just got home from AirVenture and the planning for the 2017 event is already in full forward motion. This is not me complaining at all. What it is mostly about is the full on interaction with the membership during AirVenture where we consistently heard some really good ideas from you. We always set a time aside at AirVenture to have our annual membership meeting.The problem we have long had is that this membership meeting was always scheduled on Sunday at the end of the AirVenture, the annual membership meeting always ended up being a recap of the Convention results for the VAA, but with low member attendance. This year we changed all that. With the completion of the Vintage Tall Pines pavilion we now have a facility where we can hold our Annual Membership Meeting at in the middle of the week. 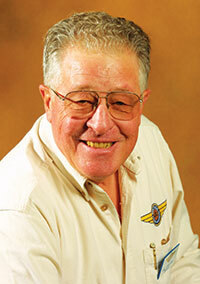 Vintage is proud to honor Phil Coulson of Lawton, Michigan, as our 2016 inductee into the Sport Aviation Hall of Fame. 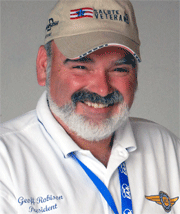 Phil will be inducted at a dinner ceremony on November 10, 2016, in the Founders’ Wing of the EAA AirVenture Museum..
As a long-time director of the Vintage Aircraft Association, Phil chaired the annual Vintage Parade of Flight during AirVenture Oshkosh and served as a long-term senior judge in the Antique category. Phil chose to take emeritus status with the VAA board in the fall of 2015 after nearly 30 years of active, involved, and dedicated service to both EAA and the VAA. What a weekend in anyone’s book! 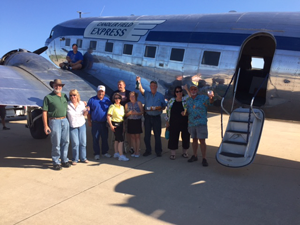 I was privileged to fly my DC-3 to Marion, Indiana, to participate in the annual Fly-In/Cruise-In event spearheaded by VAA member Ray Johnson. If you have not attended this fly-in you should put it on your list. It is a gathering of airplanes, tractors, cars, etc. that you will certainly enjoy seeing. We flew the DC-3 up from the Atlanta area on the Thursday before Labor Day arriving that afternoon. The next day we gave dual instruction to a local pilot and then took folks from the local media for a ride. We then prepared for the main day which was Saturday. I was amazed at the number of people who arrived for pancakes early that morning. The field was busy with airplane arrivals along with a huge crowd of people who drove in for the day. The weather could not have been more perfect. For us southerners, we got to enjoy a break from the heat with 70 degree weather for the weekend. We have many young people who are very interested and active in aviation. I have written the story of a couple of very involved young pilots in recent e-newsletter articles. This month we will tell the story of a young man 22 years of age who lives in Grand Forks, North Dakota. David Leiting has been interested in aviation as long as he can remember. He attended the 1994 EAA fly-in convention and has not missed a single year since that date. David is finishing up his final semester of college. He has been working this past summer as an intern for EAA. Upon his graduation from college, he will be moving into a full time role with EAA as the Chapter Outreach Specialist. David is the only member of his family with an interest in flying. He took his very first airplane ride in a Cessna 150 in January, 2002. In 2003, he participated in an EAA Young Eagles ride in a DC-3. He is currently very active in the Young Eagles program having flown over 16 Young Eagles since he received his Private pilot’s license. 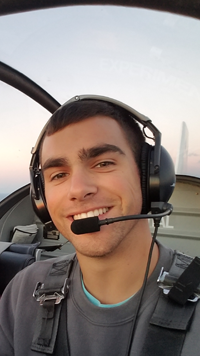 David took his first flying lesson at age 18 in a Cessna 172 while taking a flight course for college credit after deciding to pursue a college degree in aviation. Welcome to outstanding flights, a new feature in our Vintage AirMail e-Newsletter. 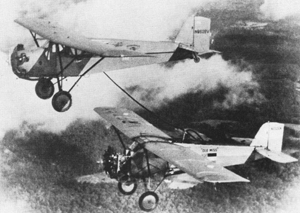 The first two attempts the Key brothers made to break the endurance record in staying aloft ended in failure, but they were determined and their third effort was successful. Read about their amazing achievement in this reprint of their outstanding flight by John C. Luck that appeared in the January 1980 issue of the AOPA Pilot. An old silver airplane sits in one of the outbuildings of the Smithsonian Institution’s Silver Hill museum and storage complex. Aside from an odd catwalk built onto the aircraft, to allow access to the engine while in flight, this plane looks much like many others flown in the 1930s. But 44 years ago some 10,000 spectators came out to meet Ole Miss, as her wheels touched down on a Mississippi airport. The story of Ole Miss begins at a small airport in Meridian, Mississippi, in the early ’30s at the beginning of the depression. Two brothers, Fred and Algene Key, natives of Meridian, had been appointed managers of the new Meridian Municipal Airport. During the depression, in Mississippi as in the rest of the country, many people weren’t sure where the next month’s rent was coming from. Business at the airport was scarce. It is feasible for an aircraft owner or builder to effectively accomplish simple repairs on sheet metal. A simple repair is one that does not involve damage to structural members or damage that affects control surface balance, etc. This discussion will be limited to simple types of repair. Major sheet metal repairs should be accomplished with the advice and assistance of a professional or only after ensuring that you have adequate knowledge. What about legalities concerning doing sheet metal repair on your own airplane? As the owner of a production plane you may legally accomplish a simple sheet metal repair if you work under the supervision of a licensed airframe mechanic. Repairing damage on a production airplane is covered under FAR Part 43. That regulation states that a licensed airframe mechanic or a FAA approved repair station must perform repairs. It also states that a person without a mechanic’s license may work on a production aircraft under the supervision of a certified airframe mechanic. That means if you own a production airplane and you do not have an airframe mechanic license, you are still allowed to work on your airplane under the supervision of a licensed mechanic. So, concerning simple sheet metal repairs on a production airplane, you are allowed to do the repair under the supervision of a licensed mechanic.